The plot of The Twenty Days of Turin can be compared to the Bermuda Triangle – lots of weird stuff supposedly happens in it, but no one knows why. Giorgio De Maria’s 1975 Italian cult classic The Twenty Days of Turin, translated into English for the first time by Ramon Glazov, is easily one of the strangest books I’ve come across in recent memory. De Maria, who’s been compared to H.P. Lovecraft, Borges and Poe, has written one of those modern-day allegories that is open to an infinite number of interpretations: a commentary on the rise of fascism in Italy, for example, or a foreshadowing of the phenomenon of social media. It’s all a bit of a conceptual mess, but no less enjoyable for it. Our adventure begins when an unnamed journalist traveling to Turin to investigate an incident which took place 20 years before, when a collective insomnia took hold of most of the town’s population, causing them to shamble through the streets and squares at night in vulnerable, fugue-like states. The following morning the mangled remains of the victims are discovered – their bodies broken at odd angles as if they’d been swung about by the feet. The murderers are never identified and the events remain shrouded in mystery. This dark time comes to be known (conveniently) as the Twenty Days of Turin. At the same time as bodies are being found, a group of young men travel door to door inviting residents to join a shadowy institution known as the Library. The Library is a place in which average people are encouraged to deposit and read each others private journals. A kind of social experiment created to foster community and relationships, encouraging strangers to connect through the sharing of each other’s deepest and darkest secrets. Everything could be deposited into the Library: works that were slender or unnaturally bulky, sometimes with a disarming naiveté in a world of slyness. Masterpieces could appear by accident, but they were about as easy to track down as a particle of gold in a heap of gravel. There were manuscripts whose first hundred pages didn’t reveal any oddity, which then crumbled little by little into the depths of bottomless madness; or works that seemed normal at the beginning and end, but were pitted with fearful abysses further inward. Others, meanwhile, were conceived in a spirit of pure malice: pages and pages just to indicate, to a poor elderly woman without children or a husband, that her skin was the color of a lemon and her spine was warping – things she already knew well enough. The range was infinite: it had the variety and a the same time the wretchedness of things that can’t find harmony with Creation, but still exist, and need someone to observe them, if only to recognize that it was another like himself who’d created them. As the journalist attempts to unravel the layers of mysteries surrounding, and connections linking, the Twenty Days and the Library, unidentified forces are rising against him. Time is running out. And the events of the Twenty Days appear to be happening again. I read H.P. Lovecraft when I was too young to understand what a horrible and damaged human being he was. I read his work superficially, enjoying the horror stories without comprehending the racist subtext they contained. I think this is how it was for many people, and as a result it can be hard to reconcile the stories we enjoy with the madness (and hatred) of the man who wrote them. The Shadow Over Innsmouth was my favorite. The premise of a fishing village haunted by alien gods known as the Deep Ones fascinated me. And the formula of the first person narrator, descending into madness, investigating a mysterious evil that he suddenly (and tragically) finds himself the focus of is hard to mess up. Giorgio De Maria obviously read Lovecraft, too, because he follows that same formula. He inserts interviews, recordings and correspondences – building layer upon layer of false reality until the reader finds herself half convinced that what she is reading is true. But Lovecraft is just one in a patchwork of influences. There are a lot of rabbit holes on these pages for readers interested in falling down. Time is measured in intervals of twenty in a surprising number of folktales (For example: Rip Van Winkle and his predecessor Peter Klaus’ naps both lasted that long). And while the victims of the Twenty Days suffered from lack of sleep versus too much – I was still reminded of these older tales in which ordinary people join the games or celebrations of powerful, supernatural beings and suffer as a result. Like folktales which come to us through an oral traditions of storytelling, The Twenty Days of Turin has an abridged quality to it. It has its own supernatural beings and their minions, who are central to the plot, but whose motivations are never adequately explored. Elements like the Library are introduced seemingly because the writer finds them interesting (rightfully so) or because they embellish the text. Not because they contribute to the overall narrative. De Maria creates and relies on all these mythological touchstones without bothering to explain them. We are, in a way, being asked to revert to a naive reader. One who embraces superstition as an explanation for the unknown. 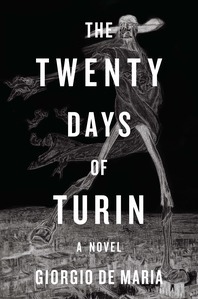 The Twenty Days of Turin can be classified as a novella. It takes up only 144 of the 186 pages of the physical book, which also includes two short stories by the same author: The Death of Missolonghi and Phenomenology of the Screamer, tacked on as appendices. There’s also a twelve page Translator’s Introduction. The two short stories aren’t very interesting and I found the Introduction a needless distraction, which is unusual for me. (I am a conscientious reader of forwards, introductions, afterwords and translators notes). But the author’s voice is what pulls you into this story and nothing should be allowed to detract from it. The symbolism and atmosphere are what make up for the overall lack of depth. And, it’s probably no coincidence that the actual, titular story is short enough that, even if your left dissatisfied with the ending and what passes for a resolution of the mysteries, you won’t feel you’ve wasted two hours of your life you can never get back. In this way The Twenty Days of Turin is the rare exception to the rule: the sum of its parts are by far greater than its whole.